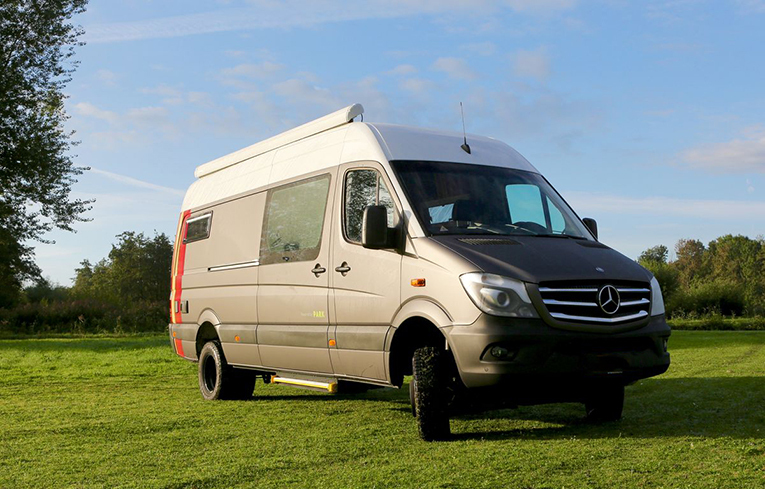 Tim Selders, the owner of a self-built motorhome based on a four-wheel drive Mercedes Sprinter, is an adventurer and a perfectionist. He did a great deal of research before deciding on the final shape of his ideal motorhome, even creating a full cardboard mock-up of his interior design in a container. The electrical system was subject to the same level of consideration and scrutiny by Selders. It had to be better and more robust than most of the systems he had seen during many visits to motorhome exhibitions. Searching the internet he came across Mastervolt, and ultimately had his system designed by our engineers along with service partner Amrit Watersport in Arnhem. 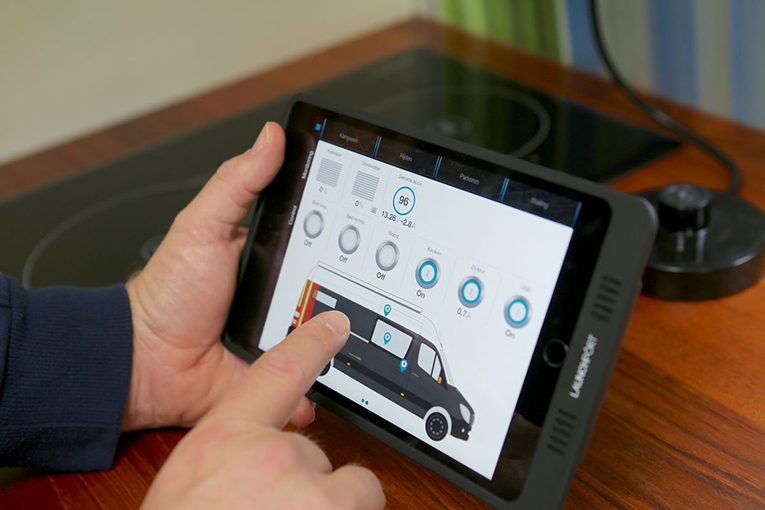 It was clear from the get-go that this electrical system would, in addition to having reliable and solid components, have to be exceptionally smart and have the option to be operated from an iPad. The solution for meeting this particular set of requirements was Mastervolt’s intelligent network technology: MasterBus and CZone. Linking these two network structures together via the Wireless Interface created a flexible network with endless automation and monitoring possibilities for Selders’ Mercedes. Together with a balanced choice of components, this resulted in a well thought-out power system, one that was more than sufficient to function without mains power for quite a while. The blinds adopt a suitable position. The window on the side door is darkened with a special kind of film, which turns clear or dark depending on the voltage to which it is subjected. All internal electronics adapt to the camping position. All system consumers can also of course be separately switched on and off via the iPad. The tablet also provides information about outdoor & indoor temperature and the available drinking water and wastewater capacity. Monitoring and operation via a single display, in this case an iPad. The tablet also provides readouts of data such as battery status and inverter capacity. The capacity to create handy modes of operation: complete convenience at the press of a button. Long periods of independence from the grid. 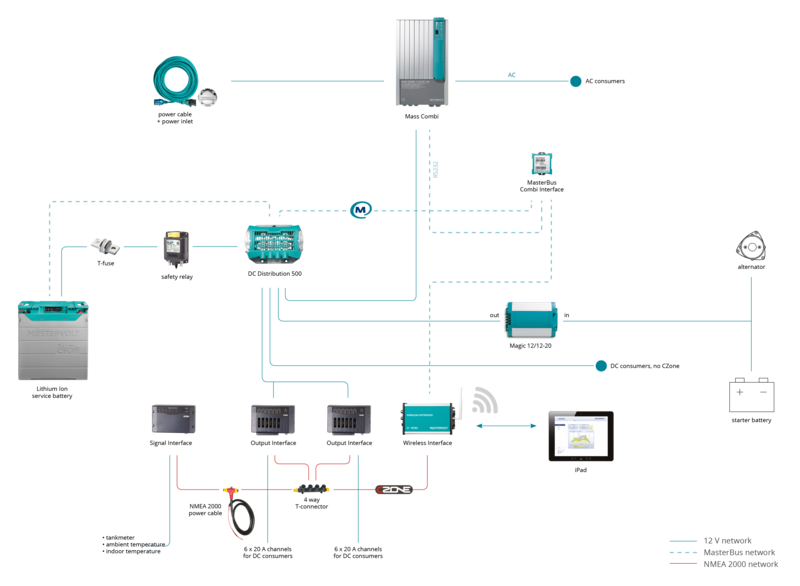 Charging grid power without thinking: as soon as there is a mains connection, the Combi links it directly to the AC consumers while also charging the Lithium Ion battery in parallel. The biggest daily AC consumers in the Mercedes include several LED groups for lighting, a refrigerator, kitchen appliances, a smart screen and underfloor heating. The design of the system also takes into account a number of ‘free’ consumers to be determined. The battery is the heart of the electrical system in this motorhome. Given the space limitations, both the size and capacity of the battery were highly relevant. This is why the owner and installer opted for the highly compact MLI Ultra 12/2500 Li-ion battery providing no fewer than 180 amp-hours. Thanks to this mini power station, the motorhome can spend a night in a place without any mains connection – ideal for independent and adventurous travel, with no prior arrangements necessary. This battery charger and inverter in one has an inverter capacity of up to 1600 watts. That means there is always energy for heavy AC consumers, such as the TV and Nespresso coffee machine. The Wireless Interface and free downloadable app allow the entire system to be monitored and operated via iPad. The Wireless Interface provides for a wireless connection between the iPad and the Mastervolt system, and can also act as a client for the main router. This has the advantage of letting users log onto one wireless network to use both the internet and other applications.